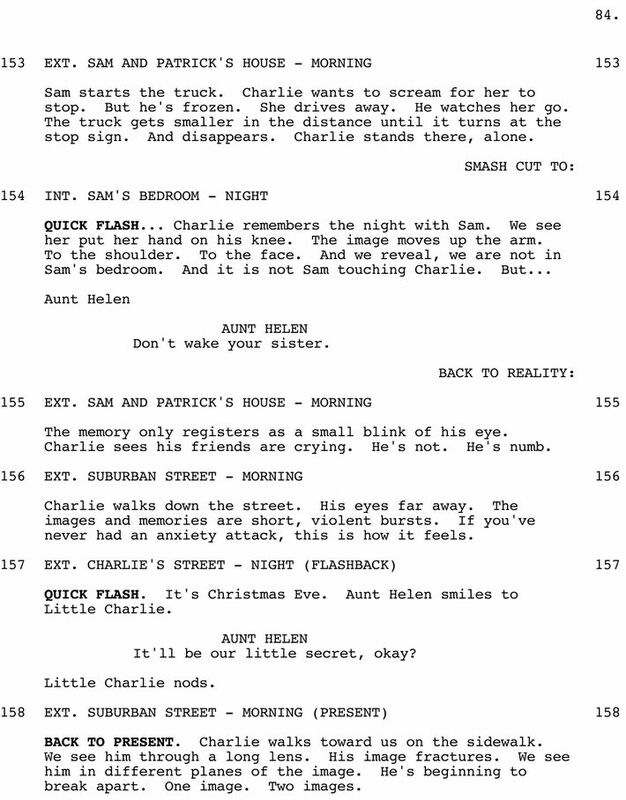 The scene that was both hardest to crack and also had the most different versions was Charlie’s breakdown. I knew I wanted to tell an emotional story, because my novel’s an emotional story, but I also knew that since film is more visceral, there would only be so much emotional heaviness that an audience could take. 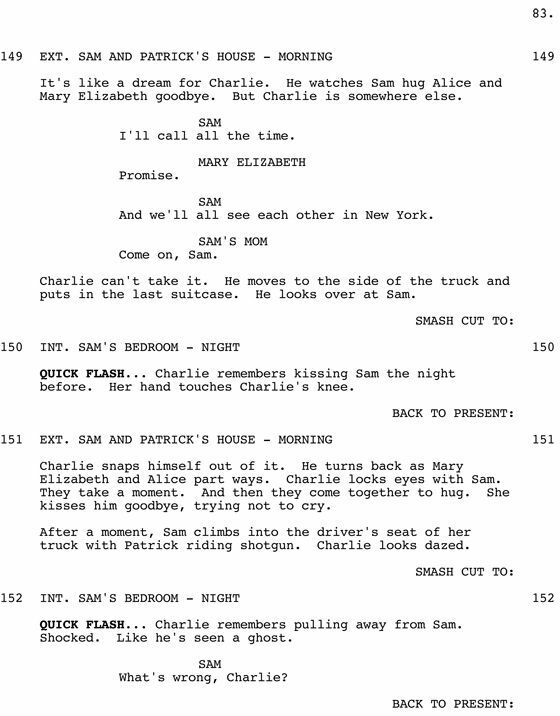 What I figured out early on was if I make the audience go through what Charlie is going through as much as possible, in that if Charlie blacks out, we black out, then I can talk about every emotion I want to and not burn out the audience. On set, once I saw Logan Lerman delivering that performance, I realized that now I had my maypole to build my scene around. You cannot underestimate how when you write, “Charlie cries” — two words on a piece of paper — it’s not the same thing as this young man delivering this moment. I had to write new dialogue when his sister is talking to him on the phone, because my lead delivered something that was better than what I’d hoped. Once I had the footage, I thought that the big aha moment would be revealing his aunt’s death — and that’s what I was writing the screenplay to build to — but once I got the film on its feet, I realized it wasn’t enough of a payoff. We’d already guessed that’s what had happened, so instead, I put it in the middle of the movie. Now I needed a new aha moment. 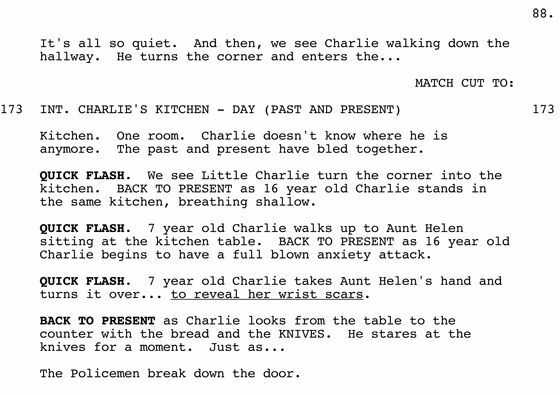 As I was cutting the footage, I saw that Charlie as a little boy was walking in the same room that Charlie as a grown teenager was having a breakdown in. I originally had a different plan for that footage, but when I saw it played side by side, that became my aha moment. I became interested in exploring the emotional idea of a haunted house, and it became far more powerful than even the best version of the death reveal could have been. 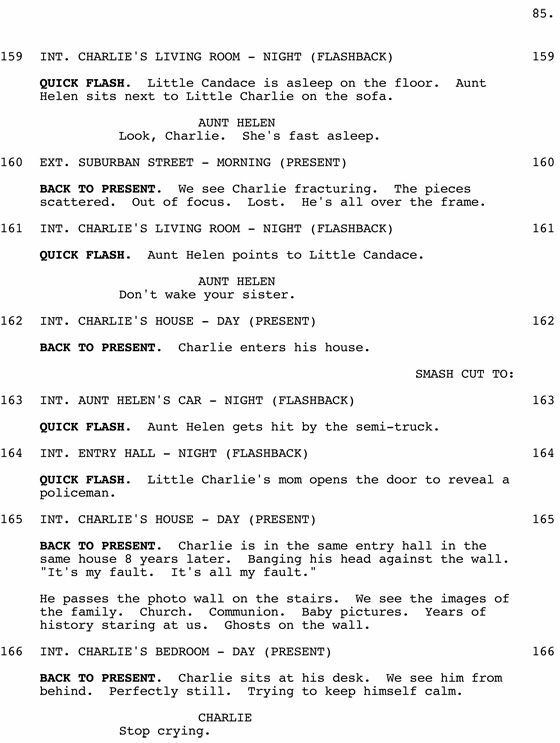 I have a saying: There’s a difference between filming a script and making a movie. I was not precious about cutting things for the movie, because I already had the novel exactly the way I wanted it to be. I’ll give you another example, though it has nothing to do with this scene: I had it in my mind that after they graduated, the characters would run up this hill, and there was a hill that I’d always wanted to film. I’m talking seventeen years that I wanted to film this shot! And then we were supposed to shoot it on a Monday night, and on the Friday before, we were doing a football scene, and I turned around and saw the bleachers at sunset and thought, Wow, that is a beautiful shot. And in that moment, I changed it from the hill to the bleachers, and it became one of the best images in the film. You have to listen to your intuition.